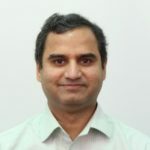 While Tarun couldn’t attend the MVP Summit in person (having just gotten married it didn’t seem the most prudent use of his vacation time<g>); he was definitely well missed and more importantly put the time to good use and added another post to the MVP Blog series. Tarun, hopefully we will see you next year! * In this blog post, I’ll refer to my customer as Fabrikam Fiber. Demand Management @ Fabrikam Fiber is currently done using MS Excel. 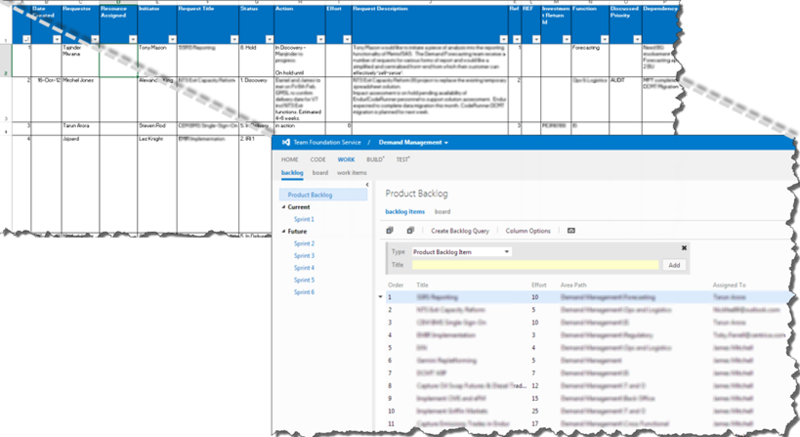 The demand management excel sheet is used to track the delivery state of the IT projects in flight and various other requests in the backlog that have the potential to become independent IT projects. Fabrikam Fiber uses the below shown workflow to access the scope, time, money and value for any item added to the demand management sheet. Create a new team project on the companies team project collection and call is ‘Fabrikam Demand Management’. Upload the contents of the demand management excel sheet to the brand new team project. This can easily be done using the excel integration that TFS provides. While in the backlog view, click on the board tab to navigate to the Kanban board view. By default you will see all the newly entered product backlog items or bugs in this view. Refer to the screen shot below. 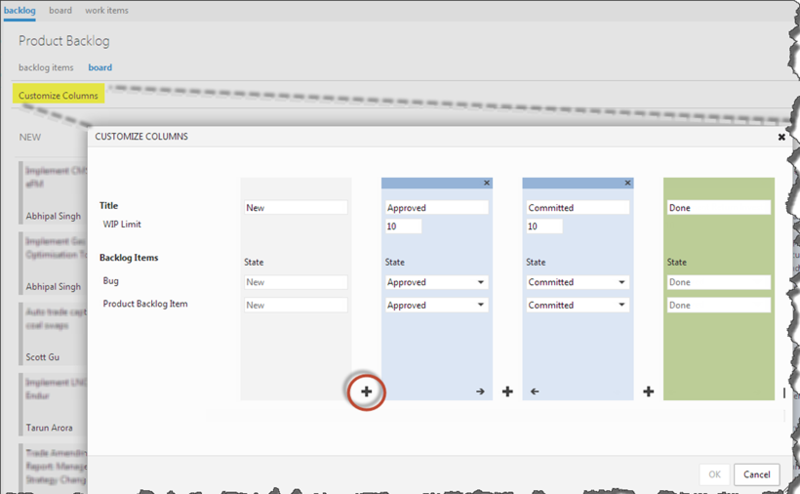 Now click on the Customize Column link on the left side corner in the Kanban board. You will see the Customize Column window. 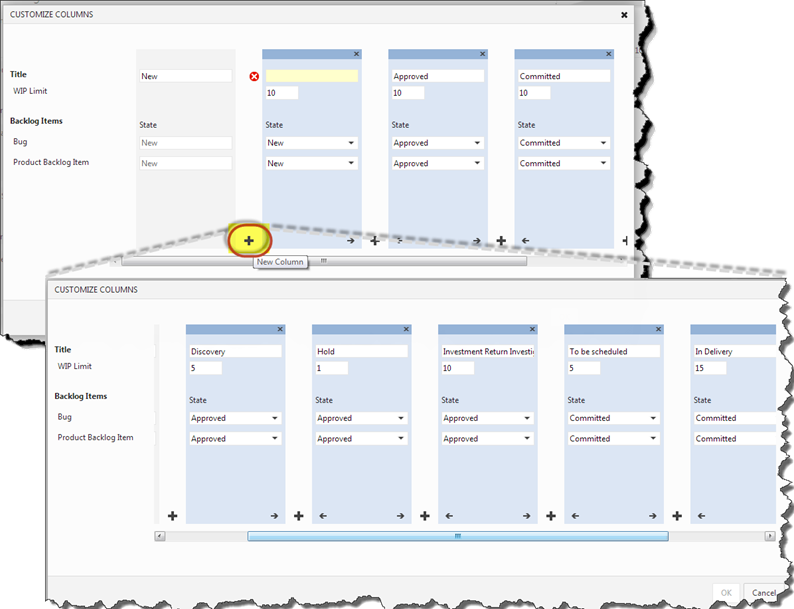 This window will show you the current swim lane configuration for Bug and Product Backlog Type work items. As you can see any bug or product backlog item in the new state will be assigned to the new swim lane because of this configuration. similarly for approved, committed and done states. You also have the ability to customize the work in progress limit on each of these swim lanes. If the swim lane has more work items assigned than the prescribed limit, the swim lane header turns red to show this violation. This gives you the ability to control the amount of work assigned to a state. By clicking on the ‘+’ icon you can introduce one or more swim lanes. Why would I want to add more swim lanes? In Fabrikam Fiber a work item stays in the approved state during its journey in the workflow from Discovery => Investment Return Investigation and only gets committed to once it has successfully passed through these states. By only having one approved swim lane, it is very difficult to track the progress of the work item from Discovery => Investment Return Investigation. An approved work item goes through the discovery phase and investment return investigation phase, the company does not encourage more than 5 items in discovery and 10 items in investment return investigation phase. It is possible that an approved work item may be put on hold, the company does not encourage more than 1 item on hold. A work item in the committed state goes through the to be scheduled phase and in delivery phase, the company does not encourage more than 5 items in the to be scheduled phase and 15 items in the delivery phase. Click OK to be route back to the Kanban board with the newly configured swim lanes. Notice that the Hold swim lane has a red header because the number of items assigned to this swim lane are more than the prescribed wip limit configured by you in the customize configuration window. As you drag and drop items from a swim lane, the work item gets updated in the background. For example in the screen shot below, when I move the first work item from the ‘Investment Return Investigation’ swim lane to the ‘To Be Scheduled’ swim lane, the work item state gets updated from Approved to Committed. 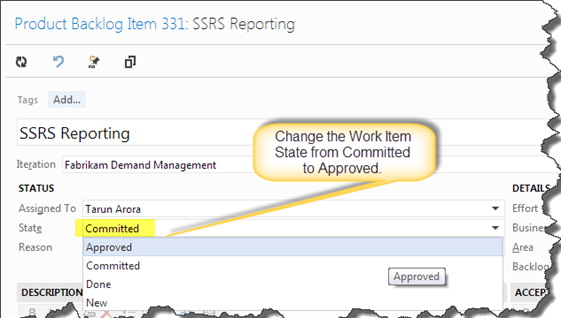 If a work item in the Committed state is assigned back to the Approved state, it is by default assigned to the first field in that state. In our case this would be Discovery. 1. How does the work item remember which swim lane it belongs to? This information is stored in fields in a work item. These fields are not visible on the work item form. 2. Can I use a WIQ to query a work item by field? No, the work item cannot be queried by its field. The field information is not stored in the TFS warehouse. You can however query this information using the TFS API. The work item gets re-assigned to the first field in the state the work item currently belongs to. So for example, in case of Fabrikam Fiber, if you removed the Investment Return Investigation swim lane, all work items currently in this swim lane would be reassigned to the swim lane Discovery which is the first swim lane in the Approved state. No, the names need to be unique. 5. What is the default limit of the new swim lane? Only 20 items show up in the new swim lane at any given time. You will have to change the priority of a work item in the product backlog for it to show up in the swim lane if it is placed > 20 in the product backlog. 6. 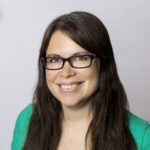 Can I change the priority of an item by dragging it over the other in the Kanban board? No, this can be done from the product backlog view. 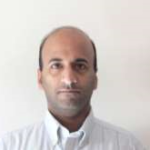 Tarun Arora is a Microsoft Certified professional developer for Enterprise Applications. He has extensively traveled around the world gaining experience learning and working in culturally diverse teams. Tarun has over 6 years of experience developing ‘Energy Trading & Risk Management’ solutions for leading Trading & Banking Enterprises. His passion for technology has earned him the Microsoft Community Contributor and Microsoft MVP Award.